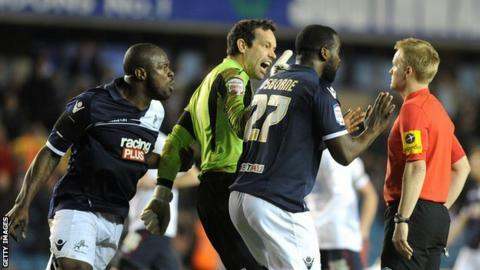 Millwall manager Kenny Jackett has hit out at the "soft" penalty given against them in their 2-1 defeat to Blackburn. Lions keeper David Forde and defender Danny Shittu were both booked for protesting after Gavin Ward pointed to the spot for a foul on Grant Hanley. Jackett told BBC London 94.9: "It looked a harsh decision. A decision like that has ultimately cost us. "I don't know what the referee has seen but we stopped it frame-by-frame on the video and it is a real soft decision." Central defender Shittu was then sent off after the final whistle for dissent and will be suspended for the visit of Nottingham Forest on Saturday. "I had gone down the tunnel by then and it is obviously the referee's decision to book him. "Danny is very upset with the decision," Jackett commented. Millwall were ahead at half-time through Karleigh Osborne's strike, but then conceded from a David Jones corner before Jordan Rhodes converted the controversial spot-kick. The result left the south London side just four points above the Championship relegation zone, although they still have a game in hand. "It swung one way then the other. We did very well for half an hour then Blackburn came back into the game. When we made the substitutions [in the second half] we got a foothold again," added Jackett. "The equaliser was a poor goal [to concede], direct from the corner. We defended the near post area very poorly. "It was 1-1 and then quite frankly it could have gone either way. We had an opportunity to claw it back or finish it off. A point would not have been a bad result for us."